I have slowly admitted that the types of horror films that terrify me to the point that I won't watch them are films about creepy dolls and clowns. But there is also another type of horror film that kind of creeps under my skin. The kind where the main character tries to convince those around them that the world is being taken over and they are slowly screwed. The Faculty is that type of film, yet has the right amount of humor thrown in to make it watchable. 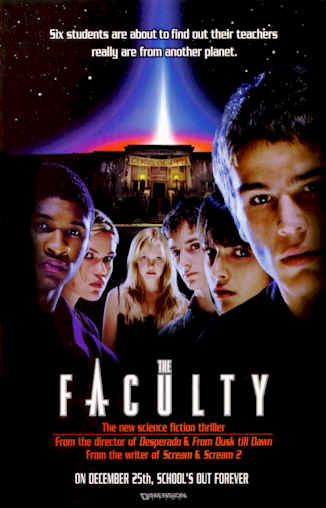 The Faculty follows the story of a high school where the teachers slowly become taken over by aliens. A group of teenagers then come together as the rest of the student body starts to become infected and they try to fight off this alien force. One thing about this film that I really liked has to be the development of the main characters. I loved how all the main characters each had their own distinct personality and can easily be somebody that viewers could relate to. You have Stokely, the outcast who makes up an identity for herself, Casey, the outsider who is constantly harassed, Delilah, the goody-two-shoes head cheerleader, Stan, the quarterback who quits to exceed in his academics, Marybeth, the perky new girl, and Zeke, the slacker who is held back in his senior year. Plus, I loved how the different characters play off of each other. I even thought that, since this was done by Kevin Williamson, who gave us the first two Scream films, it was neat how he managed to create Invasion of the Body Snatchers and make it for the Scream generation. He even includes interesting ways to figure out whether the characters are infected or not. For example, there is a scene where the main characters sniff coke since that kills the parasite that is infecting everyone else. Also, like Scream, this film manages to weave a potent blend of both horror and humor. But there was one scene that did terrify me. The one in the football game where the high school football players keep infecting their opponents and the cover of the song "Another Brick In The Wall" by Pink Floyd is playing in the background. I thought the inclusion of that cover was not only fitting since the film is about high school, but it brought quite a chill to the film that was already pretty chilling to begin with. I guess I find myself pretty freaked out by horror films that deal with people turning evil and when you try to tell people, they all think you're crazy. Overall, The Faculty is a fun sci-fi romp that feels like a modern-day Invasion of the Body Snatchers, yet it works. It has fun and colorful characters and a hefty amount and balance of both chills and humor. Absolutely. I consider this to be an underrated gem in the horror genre, so I would say give this one a watch. You'll be in for a treat. It may not be the next Thing, but it doesn't aim to be. It's a fun horror flick that serves its purpose.